When I saw that almost a third of researchers at my university were on ResearchGate and I’d barely heard of it I decided to create a profile. I’m not sure that was a good idea. Sorry about the acronyms. The network sites are down along the left: Academia.edu, Google Scholar, ORCID, ResearchGate and Researcher ID. The faculties at UiB are along the top: HUM=humanities, JUR=law, MN=sciences, MO=medicine, PS=psychology, SV=social sciences. As you can see, Academia.edu is popular in the humanities and somewhat popular in the social sciences but not so popular among other faculties. Social scientists are fairly likely to have a Google Scholar profile. And everyone except the lawyers is quite likely to have a Research Gate profile. Well, if you’re the sort of person who bothers with that kind of profile at all. Really that’s the most useful aspect of Academia.edu for me. Oh, and the fact that lots of people seem to not have worked out how to post copies of their papers to their own websites or to their institutional repository, but are perfectly happy to upload it to Academia.edu. Strange, but certainly there are quite a few publications you can find there but not easily in other ways. I’m on Google Scholar, of course. I love getting email alerts when somebody cites one of my publications. Quite often I find interesting research in that way. But mostly I use Google Scholar to find other peoples’ research by searching for it. You don’t need a scholar profile to do that. I’ve not tried Researcher ID (do I really need an ID number?) or ORCID (another “persistent digital identifier that distinguishes you from every other researcher” – I’ve never actually felt the need for that) but I did sign up for ResearchGate this week. Why on earth did they choose that name, I wonder. I thought people only added -gate to a word to indicate a political scandal was going on. On the face of it ResearchGate seems very similar to Academia.edu – you create a profile, follow others and it encourages you to upload full texts of your publications. It seems more focused on very traditional publications, though. It wants a PDF, not a URL, so for publications that are in open access web journals you have to upload a PDF of the webpage instead of simply providing a link, as I’ve done for my paper in ebr about visualising networks of electronic literature based on citations of creative works of electronic literature in dissertations in the field. Ridiculous. It automatically extracts citations and references but imperfectly, and with no way to correct the errors, for instance if you noticed that it thinks a review of Espen Aarseth’s book Cybertext actually is the book. It couldn’t figure out the references in my visualising paper. And it only counts citations from articles that are in its database. It asks you to upload datasets, and I did upload my gephi files for the visualising e-lit paper, but can’t see how you would get to the dataset from the paper. What annoys me most is the lack of URLs – ResearchGate really seems to want to be a closed garden, locking all the research in the world into its system and not providing links elsewhere. The statistics it provides support this closed atmosphere. 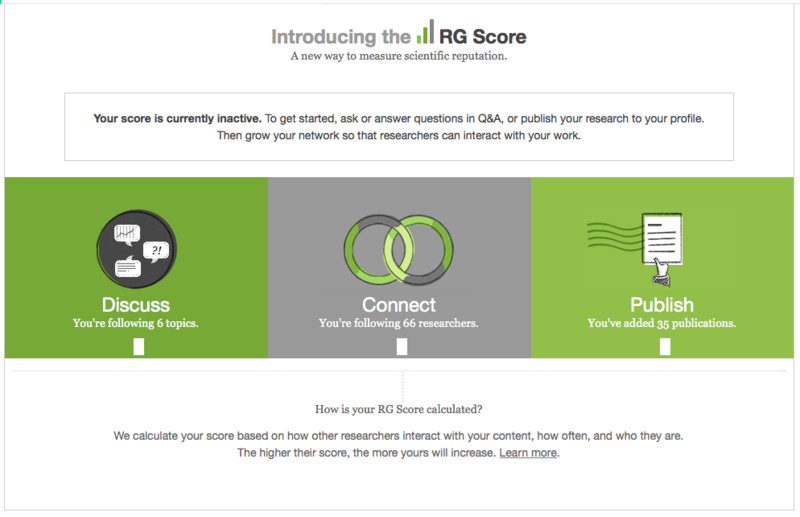 You get a ResearchGate score based not on your research in general, but on how other people on ResearchGate interact with your research. And this is “A new way to measure scientific reputation.” Sure, when I see there’s a score I kind of want to win the points, you know, but this is a very specific score. It really doesn’t tell you much about a researcher’s actual impact on their field, I think it mostly tells you whether they’re active on ResearchGate. I don’t actually have a score yet since I’m a newbie. Are you on any of these networks? Are they worth it? How are they useful to you? At my last job at a university we helped set up ORCID integration with the campus directory. I’ve heard/found that ORCIDs are more common and useful for places where there is a lot of name collision (esp. Asia) so it is helpful to ensure that your citations are actually wrapped up with your name and your work. I’ve also seen them more popular in the hard sciences, but this is all from an outside or tangential to academia perspective! ResearchGate will spam others, using YOUR name. That is why they have so many users. But the users don’t stick, the site is pretty dead. Some students that were tricked into it, mostly. Next to no senior researchers.